Salam & hello everyone! I don't really get to do Fragrance Friday do I. Hehe, this is because I don't have that many of fragrance but hopefully soon I get all the fragrance I want! Introducing the new Belara Midnight by Mary Kay launch last month in November. I was crazily sniffing my new love that is the Antipodes Joyful hand and body lotion where I got it from MIVVA box, the smell is so good and it features Wild berries scent. I was wondering if there is a fragrance that smells like wild berries because I prefer spraying than applying lotion. This come to my doorstep like perfectly. The Belara Midnight Eau de Parfum features a magnetic captivating wild berries notes meld with jasmine. It is more of a sensual sophisticated womanly scent. 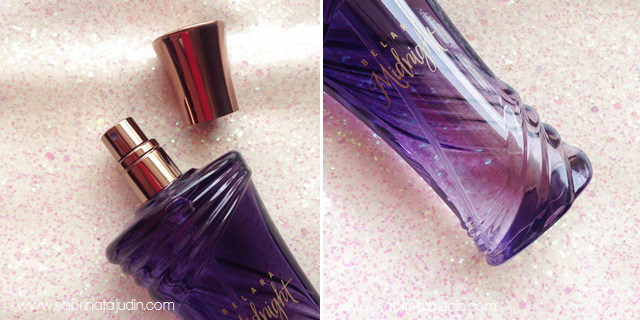 As we can see the fragrance really look like a night fragrance and I think it is better suits during the night. It is pretty sweet to me and if I apply it too much, I get stomach ace. Pretty weird heh. The bottle looks like a draped alluring purple velvet curtain made out of glass. This also comes with a Shower Creme and a Body Cream. The shower cream and body cream works wonderfully and it is really a good additional to this fragrance. 1. Top Notes - The first moments wrap you in the tempting contrast of florals and spicy berries, perfectly balanced to evoke your imagination of the possibilities to come. Notes include: Baies Rose JE*, Wild Berries and Tropicalone (a fruity berry note) *JE= Jungle Essence, a proprietary technology of the perfumer used to extract pure essences. 2. Middle Notes - As the fragrance unfolds, the heart is delicate and alluring. It intertwines irresistibly rich florals with nuances of warm vanilla notes to gently caress your senses. What perfume you love to use during the night? Sab, apasal goda lagi ni? kita dah lah gila perfume tau..
Wow, i think I'll love it! It looks like very beautiful..I think its fragnace is also good.